Once in a while, I worry that I have said everything I have to say, that I have nothing left to blog about. The mood hit yesterday, after I hit the “Publish” button, and it lasted a good 20 minutes. 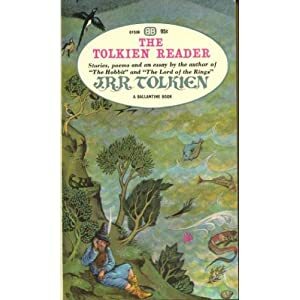 Then I remembered that for the last three years or so, my battered and yellowing copy of The Tolkien Reader has been stashed in the software cabinet, along with CD’s for Office, Photo-Shop, and Quicken. I have no idea why I put it there, but that’s where it stayed because I knew where it is was and it seemed as good a place as any. When I say yellowing, I mean the pages of this book are really yellow: it must be at least twenty-five years since I opened it, but I remembered Tolkien’s essay, “On Fairy-Stories” and had a look. It was downright eerie to see how certain passages I had underlined decades ago are relevant to my present writing interests and concerns. For instance, those who followed this blog in February will remember a three-part series I wrote on shape-shifters. “The trouble with the real folk of Faerie is that they do not always look like what they are,” says Tolkien. So thick beset wi’ thorns and briers? Though after it but few inquires. That lies across the lily leven? Though some call it the Road to Heaven. That winds about the fernie brae? Where thou and I this night maun gae. Analogies jump to mind: the imaginal realm of Archetypal Psychology, the place of soul, between the physical world and the formless world of transcendent spirit. The astral world of Hindu cosmology, described in detail in Paramahansa Yogananda’s Autobiography of a Yogi, which is far more subtle than physical reality, and far more dense than the realm of spirit. I am not just being scholarly here, but trying to point to a key fact: Faerie is analogous to the place of dreams and nightmares, of angels and demons, in old and new traditions around the world. I could cite a lot more examples. I’d recommend this essay, written in 1939, especially to writers of fantasy literature, but to writers in general, for Tolkien has much to say about another primal desire, the desire to be a creator of worlds – “sub-creator” is the phrase he uses. And finally I will end with some unexpected good news for Tolkien fans. Today’s Sacramento Bee reported that filming of The Hobbit has started after numerous delays. This will be a two year, two film project, directed by Peter Jackson, staring Martin Freeman as Bilbo, and also featuring Elijah Wood, Ian McKellan, Cate Blanchett, and Orlando Bloom. Release of film number one is expected in late 2012. Something else to look forward to for those who love to explore the world that Tolkien created. This entry was posted in Authors, Myth, oral tradition, Stories and tagged authors, Fairytales, folklore, spirituality, stories, storytelling, Tolkien. Bookmark the permalink. “Faerie is analogous to the place of dreams and nightmares, of angels and demons, in old and new traditions around the world.” To me this is the Hedge, the world beyond the gates where wytchs and shamans travel. Exactly! I was thinking of the lower, middle, and upper worlds of shamanic lore as I wrote this. Thanks! Love your site, Morgan. I’ve subscribed and am looking forward to more!